These icebox holiday cookies from America’s Test Kitchen make baking for the holidays convenient on your time. The hardest part is rolling out the dough after it has sat in the fridge. Too cold, it won’t roll. AT ALL. The dough can be used for cutout cookies or simply sliced from a log. Lots of options with this dough! If you can’t find superfine sugar in the supermarket, simply process 1 cup granulated sugar in a food processor for about 30 seconds, then measure out 3/4 cup for the recipe. The dough scraps can be patted together, chilled, and rerolled one time only. For best results, be sure to bake the cookies one sheet at a time. 1. Whisk the flour, sugar, and salt together in a large bowl. Using an electric mixer on medium-low speed, beat the butter into the flour mixture, one piece at a time. Continue to beat the flour-butter mixture until it looks crumbly and slightly wet, 1 to 2 minutes. 2. Beat in the cream cheese and vanilla until the dough just begins to form large clumps, about 30 seconds. Knead the dough in the bowl by hand a few times until it forms into a large cohesive mass. 3. Transfer the dough to a clean counter and divide it into 2 even pieces. Press each piece of dough into a 5-inch square, wrap tightly in plastic wrap and refrigerator until the dough is firm yet malleable, about 30 minutes. 4. Working with one piece of dough at a time, roll it out between 2 large sheets of parchment paper to a 12 by 7-inch rectangle. Remove the top layer of parchment and sprinkle with half of the sugar, leaving a 1/4-inch border along the edges. Spritz the sugar lightly with water to dampen. 5. Working from the short side, roll the dough tightly into a log, pat the log to measure 7 inches, and smear the seam with your fingers to seal. Wrap the dough in plastic wrap and refrigerate until firm, about 2 hours. 6. Adjust an oven rack to the middle position and heat the oven to 375 degrees. Line 2 large baking sheets with parchment paper. Trim and discard (or eat!) about 1/2 inch from both ends of the log. 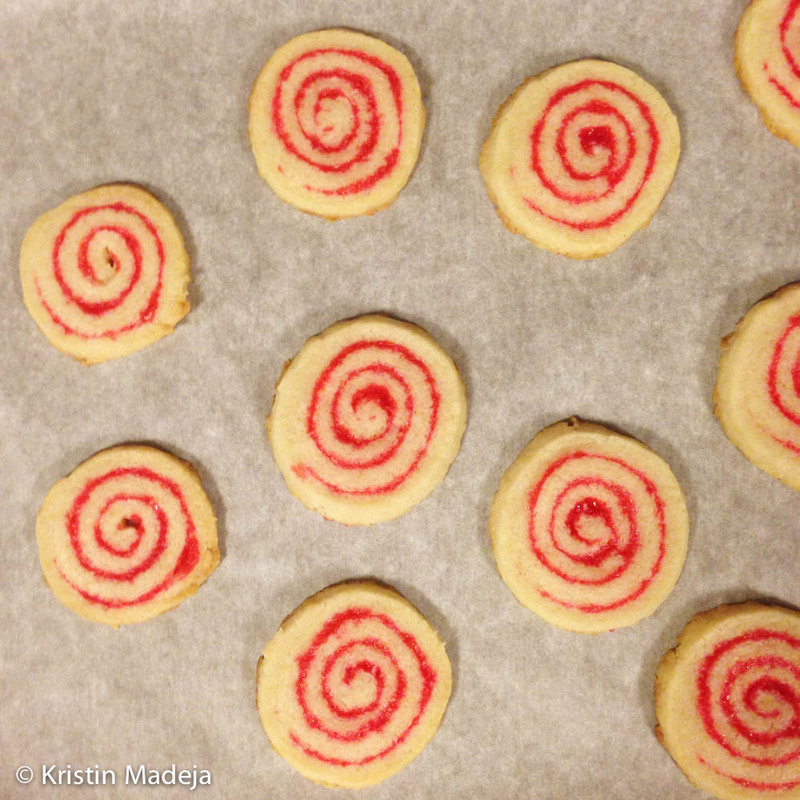 Slice the dough into 1/4-inch-thick cookies. Lay the cookies on the prepared baking sheets, spaced about 1 inch apart. 7. Bake the cookies, one sheet at a time until light golden brown, 12-15 minutes, rotating the baking sheet halfway through baking. Let the cookies cool on the baking sheets for 3 minutes, then transfer to a wire rack to cool completely before serving.